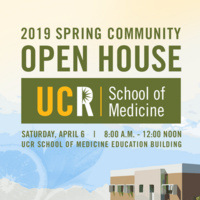 The UCR School of Medicine will be holding our Spring Community Open House on Saturday, April 6th, 2019 from 8 a.m. - 12 noon at the School of Medicine Education Building. This community event will feature our pipeline programs and will offer a variety of activities including student panel discussions, information on medical school admissions, CPR, clinical skills and Sim Lab demonstrations, curriculum demonstrations, pipeline program informational tables, and a special Kid Zone of interactive activities for our younger visitors. Spring Open House will be held rain or shine. Complimentary parking will be located in Lot 13. Please RSVP at https://atu.cr/somopenhouse19 or contact Kate Dorff at kate.dorff@medsch.ucr.edu 951-827-7794 for more information. We hope you will be able to come and enjoy the day with us!